Located at the southwestern tip of the archipelago of Japan, climate of Ishigaki is nothing like that of typical Japan. Its latitude is further down south from Miami, and the island is blessed with subtropical weather perfectly suited for scuba diving vacation. 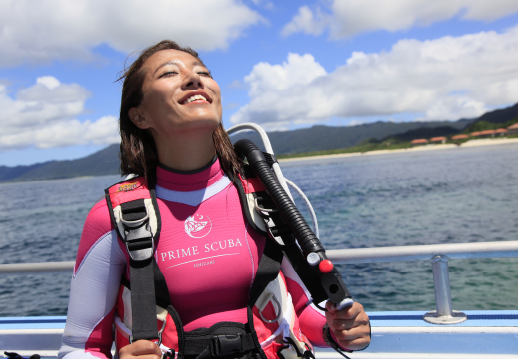 Diving is available all year round in Ishigaki. Summer is unequivocally gorgeous, whereas spring and autumn is perfect for those who would rather avoid the summer crowd, but still want to enjoy tropical vacation. 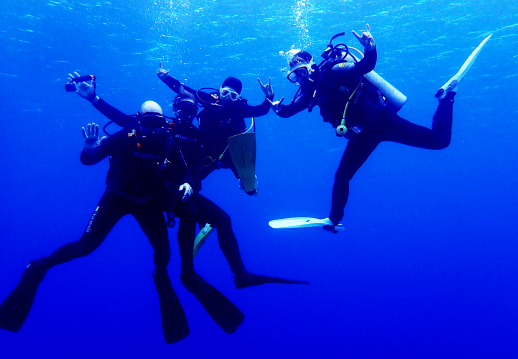 Although not typical tropical diving, winter would be great for diving freaks who are looking for super clear blue water and spacious luxury dive cruise. Ishigaki winter is never cold – its low of 18C (64F) is as far as it goes on the ground, and there are some days with above 23C (73F). Although sunny days don’t usually last, breathtakingly clear blue water with visibility of over 30m is never unusual. Water temperature will be around 22C (71F), and 5mm wetsuit with hood vest would be just fine. 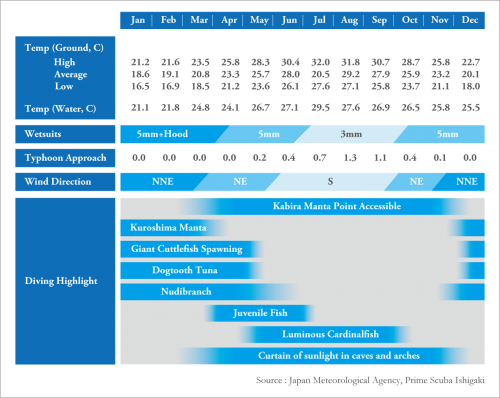 Due to the seasonal north wind, winter dive points will mainly around the south side of Ishigaki and Yaeyama islands. 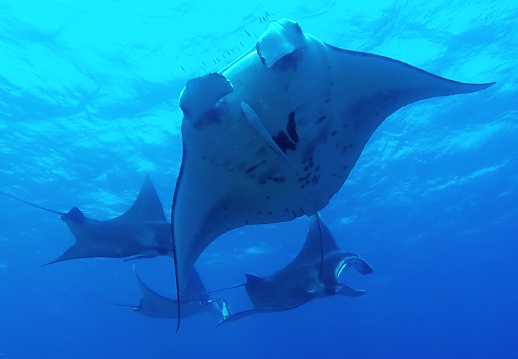 Although the most popular manta points around Kabira area are generally not accessible, mantas are often sited around Kuroshima area, feeding on planktons. Big fish such as Dogtooth tuna is regularly seen during the period, and it is the peak season for nudibranch. It is the low season, and you will have much more space on the boat. Ishigaki beaches open around mid March, so its spring is more like early summer. There will be days of nearly 30C (86F) on the ground, and sun screen is a must-have. Nevertheless, the water needs a bit more time to warm up, and it is nice and cool under the water. The wind will start to blow from the south, and diving becomes available at all the areas of Ishigaki and surrounding islands, including Kabira manta points. Once the rainy season is over around the end of June, the real summer starts in Ishigaki. There will be some days of strong south wind right after the rainy season is over, and also the typhoon season will kick off. Many typhoons will be born around Micronesia, but number of those that approach Ishigaki is usually limited to 2-3 every year. When the port closes, it usually takes around 3 days to re-open. Complex geography of Ishigaki and surrounding islands almost always provides us with some dive points shielded from wind, and diving is usually available as far as the port remains open. The seasonal north wind starts to bring some dry air to the island, and the scorching hot weather of summer will be over. The boat deck will no longer be burning hot, and a nap after lunch under gorgeous sunshine and nice breeze will be hard to resist. At Kabira manta point, there are days with number of mantas, and siting of over a dozen at the same time have been reported number of times during autumn.